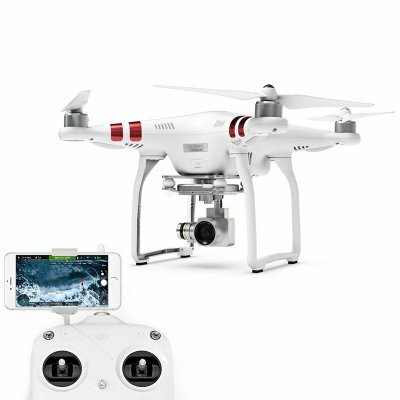 Successfully Added DJI Phantom P3 Drone - 2K Camera, 12MP Pictures, Stable Footage, 720P Real-Time View, 25 Min Flight Time, GPS to your Shopping Cart. The DJI Phantom P3 is the perfect video drone for those of you that are searching for a top-end piece of equipment. This high-end Quad-Copter has been designed by DJI, a true top player in the drone industry. Quad-Copters manufactured by DJI are well trusted and generally considered to be the best commercially available drones. For all photography lovers out there, the Quad-Copter comes with an exceptional 2K camera that features a 1/2.3-Inch sensor. Thanks to this, you’ll be able to shoot stunning 12MP pictures and 2K video at 30fps. This 2K video drone features an extremely durable design. It can be used by both professional drone pilots and beginners alike. The drone is extremely easy to maneuver and is capable of flying in nearly any weather condition. Additionally, this DJI drone comes with plenty if in-flight features to enhance your flying experience. Whether you use it to cruise through the skies, or snap amazing pictures – this 2K video Quad-Copter is guaranteed to meet your demands. The camera provides you with detailed and stabilized images. Thanks to this, you’ll always be treated with beautiful footage shot from above. With its 2600mAh battery, this DJI Quad-Copter offers up to 25 minutes of flight time. Due to this, it outperforms the vast majority of other drones on the market. It furthermore comes with a built-in GPS that brings along plenty of additional in-flight features. Also, you’ll be able to follow live stream footage on your smartphone while using the dedicated mobile application. By allowing you to watch the 720P in-flight footage, you’ll be able to undergo a true drone pilot experience. No matter your intentions, this 2K video Quad-Copter is guaranteed to bring along hours worth of fun and entertainment for young and old. The DJI Phantom P3 comes with a 12 months warranty, brought to you by the leader in electronic devices as well as wholesale electronic gadgets..